Belkin has a few cool new products up its sleeve for CES, with three that have cool implications for the smart home and internet of things and one that’s good news for router nerds. Three are products and one is a capability it’s adding to its Linksys line of routers that will use WeMo devices and the router to determine where you are in the home. On the product side, the company is adding connected LED light bulbs to its WeMo line of connected devices. For $129.99 you get two dimmable LED light bulbs and a bridge component that will connect over your home’s WiFi network. Additional bulbs are $39.99. These won’t change color but are a bit cheaper than the Philips Hue connected bulbs. You can manage up to 50 lights on one bridge. This means WeMo now has connected bulbs, outlets and wall switches giving consumers a lot of options when it comes to connecting their lighting. Ironically I’ve found that in using my Hue connected lights in my living room is somewhat tough because I tend to turn the lights off at the switch by habit. I almost want to add a connected switch so when I’m playing with the lights in the app, I don’t have to get up and flip the switch. But that seems ridiculous. 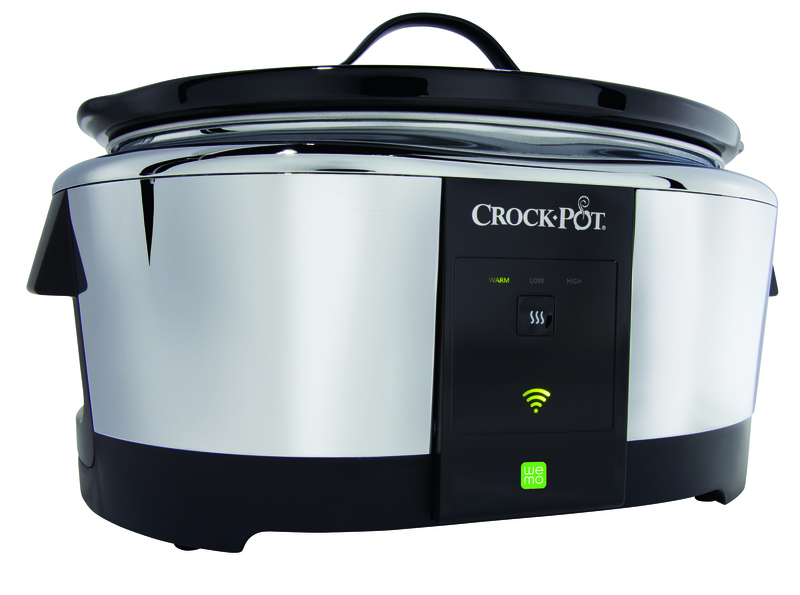 The second news element is that the Belkin deal with Jardin foods ( maker of Crock-Pots and other kitchen appliances) has yielded a $99.99 connected WeMo slow cooker. This is not the refrigerated slow cooker of my dreams, but it’s a start. It lets people control the temperature of their food remotely. The other product news is interesting, because Belkin is reaching out to the maker community with a box called the WeMo Maker, which adds connectivity to any device controlled with a DC switch. This could be a garage door, robotics projects, motors, sprinkler systems and other DC powered devices. The WeMo Maker is a module you wire into the device including sensors. WeMo Maker, which will be out in September will also work with IFTTT. Pricing for that isn’t out yet, but it’s the most interesting element of the WeMo ecosystem from my perspective. Finally, Belkin is bringing back the old-school design of the Linksys WRT54G router (see below) with features people need for today’s far more complicated networks. 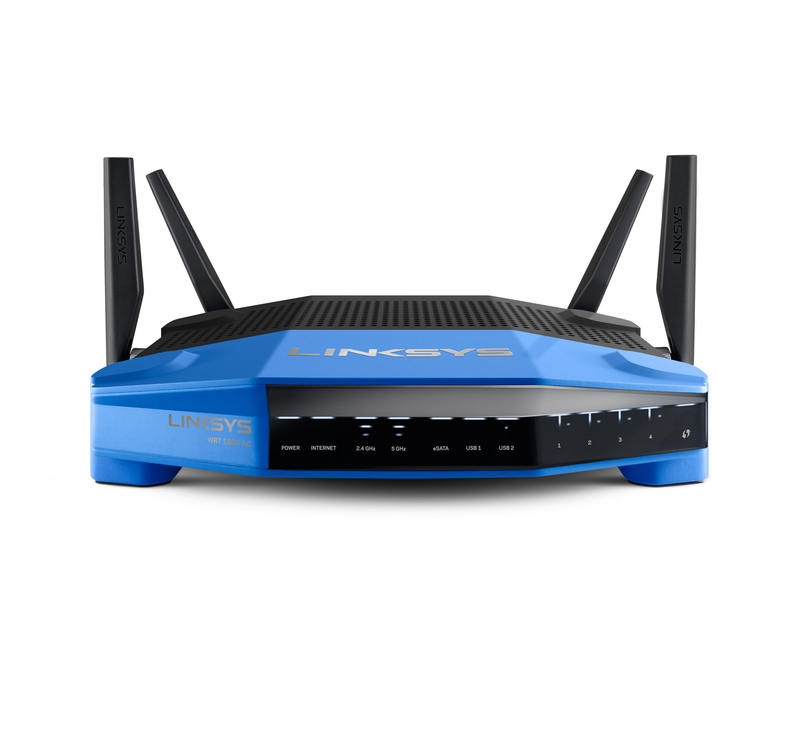 Linksys is also working with the OpenWRT community to make an open source firmware downloadable for the new router when it is available, which should be a nice addition for those that like hacking their gear. The router should be available in the Spring. Some of the features that seem worthwhile, are network maps that will let consumers see all the devices (like all those WeMo gizmos) on their network and will let them control those devices and their network access from an administrative portal. For example, you could block your child’s internet connection on all of their portable devices after a certain time. Also cool is something Belkin CEO Chet Pipkin, said the company was working on that would use WeMo products and the Linksys routers to offer users presence detection in the home. That’s not here yet, but it’s something Pipkin and I discussed on our Dec. 31 podcast. That adds another technical method to Bluetooth beacons, motion detection and microphones as a way to track where people are in the home as we attempt to make them even smarter. For my money, the better routers, smarter Wi-Fi and the WeMo Maker are probably the coolest stuff Belkin has going on related to the smart home at the moment. I think you mean for those that want to secure their networks. I’m not an open source fanatic. I use primarily iOS and Mac OSX. But network equipment, even home network equipment, needs open source firmware. It’s not just about the NSA. Anything the NSA secretly installs can be discovered and exploited by others. Even if one is untroubled by the NSA revelations, the fact that their home network might be compromised by non governmental criminal organizations should give them pause.